These weren’t a big hit with the kids but my husband and I found them quite good. I don’t think my kids were fooled by the hidden veggies! Birds Eye Fish salmon cakes are a handy and tasty meal to have with some chips.I like the herb flavour and it is so easy to make. These Salmon Fish Cakes are very tasty and my favourite way of eating them is making a fish burger with lots of tartare sauce and salad. I used to give these to my son a few years ago and he loves them. They are the perfect way to offer salmon to children, without an overly strong fishy taste and combine delicous vegies. They were a regular for some time in my freezer. These Bird’s Eye fish cakes are delicious and I love the vegies and herbs. My only wish is that there is a bit more salmon in them, otherwise they’re great. 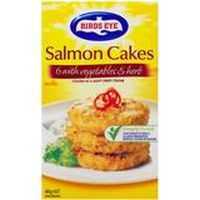 How would you rate Birds Eye Fish Cakes Salmon With Vegetables & Herbs?